Above you’ll see a screenshot from the upcoming NovelRank redesign. In fact, you can actually view it online right now. While this is only the first page, it is the basis that the entire redesign will be built upon. Below is a list of all of the improvements that are scheduled as part of NovelRank version 4’s release. I expect to complete it in the third quarter of 2015. This entry was posted in News and tagged redesign on June 9, 2015 by Mario Lurig. It’s been a request for a very long time, especially since the iPhone app has been out for years and was recently updated. But now, the Android App is available in the Google Play store. The android app was developed by me, which required learning a whole new programming language (enough to get by at least) and a whole new platform (Android). 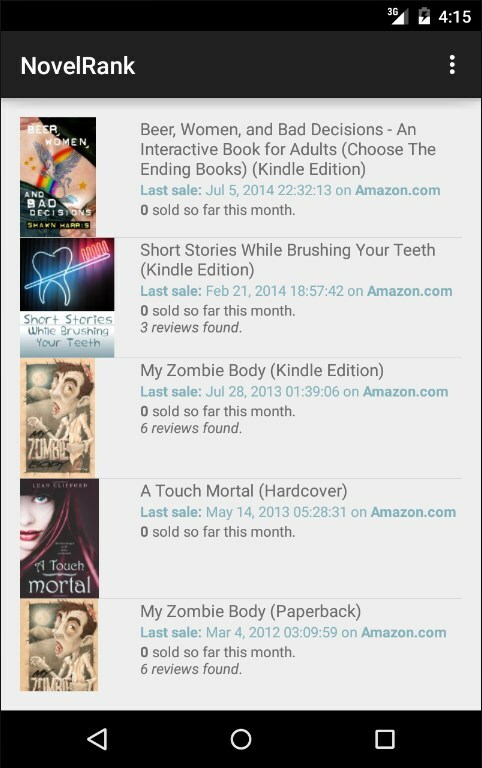 So, while the app is very simple, it does exist for Android device users like myself who wish to easily see their user account’s books on-the-go. So grab a download of the app and enjoy. Google charges $25 just to put the app up, and it was 3 weeks of work putting it all together (because it was 100% new to me), so I believed that users of a completely FREE service like NovelRank wouldn’t mind chipping in $1 for the convenience of an app. I didn’t want to charge $2.99 for the app and potentially never make back the money spent. This entry was posted in News and tagged Android, app on March 23, 2015 by Mario Lurig. In the continued effort to keep things running smoothly for everyone, it’s time to make-good on the agreement outlined in the FAQ over 5 years ago. 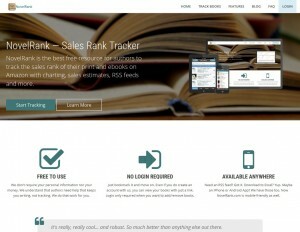 Up until now, no old salesrank data has ever been removed. That means, if you started tracking your book 5 years ago, there are 30,000 salesrank records in the database for your book! During the month of September, that number will be reduced to the last 2 years worth of data only. This doesn’t include estimated sales numbers, just salesrank records. If you would like to download them prior to them being expunged forever, you should go to a book’s detail page and click the Download to Excel/CSV option to show you the appropriate download link. 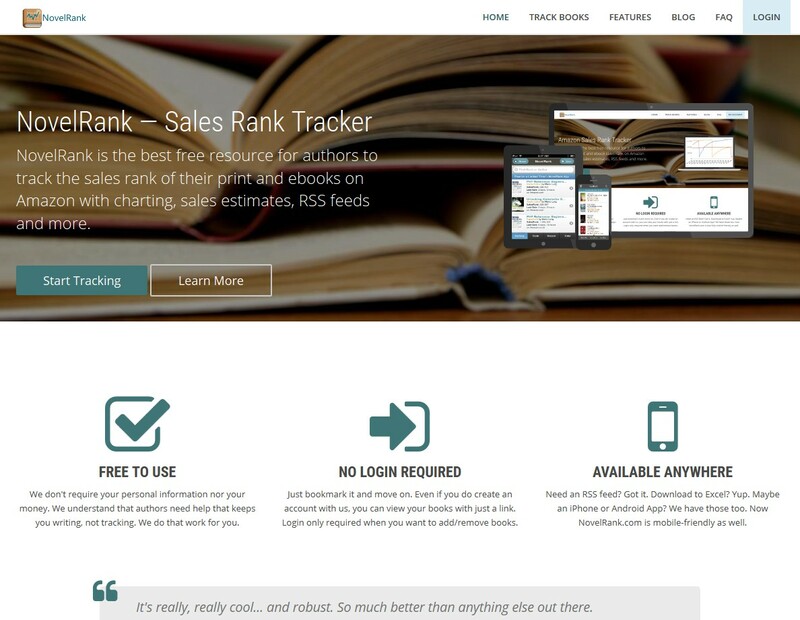 In the rare situation that a book is in the system, and after removing all but the last 2 years worth of salesrank data, it doesn’t have any new salesrank information, it will be completely removed from NovelRank. I’m sure most people really won’t care about this, as the historical salesrank information is not exactly captivating, but I did want to give everyone a heads-up. This entry was posted in News and tagged history, salesrank on September 2, 2014 by Mario Lurig. Today I’m excited to announce a new partnership with BookVibe, a new free service that not only can give you recommended reading based on your social media connections and content, but also allow you to do research into individual titles and individual twitter users to see what they are talking about. All of this is wrapped up in a clean and vibrant interface. Within NovelRank, you will now find a BookVibe link under the Twitter Search menu option at the top of any book’s page. The link will be at the top when NovelRank didn’t find any results, and at the bottom of the list when it does. 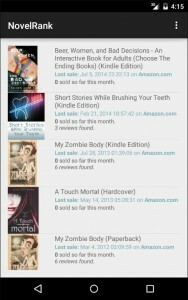 If your book isn’t yet in BookVibe’s system, don’t worry, they’ll have it up and ready within ~48 hours. I hope you enjoy this integration, and please let me know (Facebook comments or tweets) what you think of the integration. This entry was posted in News and tagged BookVibe, partnership, twitter on August 29, 2014 by Mario Lurig.